The persistence and the complication of wars in Africa are partially due to small arms proliferation. The consequences of small arms on African people due to international conflicts within Africa, rebel group activities, mercenary groups, and armed gang activities have yet to be fully measured. The International Action Network on Small Arms, Saferworld, and Oxfam International put it in perspective when they reported that armed conflict cost Africa $18 billion each year and about US$300 billion between 1990-2005. During this period, 23 African nations experienced war: Algeria, Angola, Burundi, Central Africa Republic, Chad, Democratic Republic of Congo (DRC), Republic of Congo, Cote d’Ivoire, Djibouti, Eritrea, Ethiopia, Ghana, Guinea, Guinea-Bissau, Liberia, Niger, Nigeria, Rwanda, Senegal, Sierra Leone, South Africa, Sudan, and Uganda. Although proliferation of small arms generates a lot of money for those who manufacture and trade them, African people pay a heavy price due to a lack of accountability or international regulations to address the abuses those products cause. According to the Global Facilitation Network Security Sector Reform, nations such as France, Russia, China, UK and USA – the five permanent members of the UN Security Council – together account for 88 percent of the world’s conventional arms exports. These exports contribute regularly to gross abuses of human rights in Africa and elsewhere. Some of these are legal arms sales to irresponsible governments who use them to oppress the people. Other supplies are made available to rebel groups by some countries in an effort to overthrow dictatorial regimes which in many cases become worse or as bad as the previous regime. The United States and France, for example, assisted Chadian President Idriss Deby in removing his predecessor, Hissene Habre, from power. Deby then became another dictator who still has not stabilized his country. In fact, more than ever before, strong measures and appropriate attention must be given to this issue . The United Nation’s General Assembly resolution (A/C.1/63/L.39*) on the arms trade treaty aims to establish common international standards for the import, export and transfer of conventional arms. It states that the absence of these standards is “one of the contributory factors to conflict, the displacement of people, crime and terrorism, thereby undermining peace, reconciliation, safety, security, stability and sustainable social and economic development.” In addition to finding a solution to the proliferation of small arms, manufacturers and traders of small weapons should bear partial responsibility for the abuses and crimes that are committed as a consequence of use of these arms. Among nations that are culpable, let us single out the United States, as Africa Faith and Justice Network’s mission is to advocate for just and fair U.S.-Africa relations. The same way U.S military policies in Africa have promoted dictatorship rather than democracy, the presence of American made weapons on the African continent has hurt the African people more than it has helped. The U.S. is aware that some of their legally transferred weapons contribute to feeding the illegal arms market. It was U.S. made weapons that supported the rebel groups RENAMO in Mozambique, UNITA in Angola, RPF in Rwanda and CNDP in the Democratic Republic of the Congo (DRC). 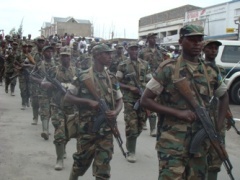 In the UN experts’ report on the crisis in the DRC, S/2008/773 , paragraph 28 connects the origin of military uniforms shipment destined to the rebel group CNDP from the United States in these terms: “In October 2008, Rwandan security services seized a shipment of uniforms destined for CNDP at Kanombe airport in Kigali. … The shipment reportedly originated in Boston, Massachusetts, United States.” Although this shipment contained uniquely military uniforms, it does not rule out the possibility that weapons were shipped from the U.S destined to CNDP. Political instability in Africa continues to create more demand for small arms. Manufacturers of weapons know best the link between politics and weapons markets and are therefore often linked to these political instabilities to take advantage of the weapons business it creates. For example, formerCongresswoman Ms. Cynthia McKinney of Georgia, in her opening remarks before the Subcommittee on International Operations and Human Rights of the Committee on International Relations of the US House of Representatives on May 17th, 2001, stated that “ [W]hat we do know is that the U.S. Special Forces and U.S funded private military companies have been arming and training Rwandan and Ugandan troops to deadly effect. I think it is appalling that the U.S. taxpayer should be directly assisting the military efforts of Rwanda and Uganda, the aggressors in this tragic conflict and who are confirmed by Amnesty International and Human Rights Watch as the authors of terrible atrocities against Congolese civilians. Our efforts in Africa have amounted to nothing more than bankrolling belligerent and mass murders.” War creates a demand for weapons. This is why manufacturers and traders are opposed to international standards for small arms trade. In addition to the illegal arms sales network, there is a link between the legal and the illegal trade that consists of illegally selling legally obtained arms. This is the core of the problem of small arms proliferation which violators are not interested in solving. As of September 26, 2008, the United States of America, France, Russia, and permanent members of the UN Security Council had not signed the protocolagainst the illicit Manufacturing of and Trafficking in Firearms, Their Parts and Components and Ammunition, a supplement to the United Nations convention against Transnational Organized Crimes. Africa Faith and Justice Network, in its advocacy effort to the US government for peace and stability in Africa, calls upon President Obama’s administration to take a leadership role on this long overdue issue. We recommend that the U.S. signs the international Arms Trade Treaty by the United Nations, passes legislation to hold violators accountable, and reforms its arms production and export policy. Such legislation should include ways to track down U.S. weapons wherever they are used to prevent illegal arms trade from the U.S. to Africa and elsewhere.